Only 118” wide x 84” deep x 102” high. Patented system outperforms less durable opposing sheet metal plate designs. 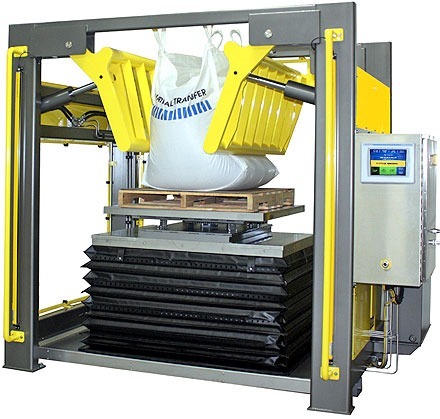 Powered rotary-lift table with 36” of travel allows complete conditioning of a wide range of bag sizes. Machine clear acrylic guarding package with load side light curtain for operator safety. Allen-Bradley PLC with PanelView 1000 Plus touch screen operator interface allows operator easy access to bulk bag and material conditioning parameters, system status, and manual mode controls.